The exposure of the poor reviewing standards doesn’t affect claims about the role of carbon dioxide either way, since melting glaciers don’t tell us anything about what caused the warming, but it does fly in the face of the IPCC’s carefully constructed PR image. After all, if thousands of expert reviewers went carefully through this document, why did it take two years for an error so eggregious to come to light? The Himalayan glaciers are hundreds of meters thick. It would take a major temperature rise to cause something so remarkable as their complete melt by 2035. Plus there are 9,500 glaciers in the Himalayas, and the claims apparently center on just 20 glaciers. Quite a few of those glaciers have incidentally stopped shrinking as of 2007. The Gangotri Glacier has not changed much in the last two years. It was retreating rapidly in the 1970′s. Pachauri said that such statements were reminiscent of “climate change deniers and school boy science”. This totally disproportionate response tells us all that this has nothing to do with science. What amazes me is that the IPCC report actually quotes “WWF”. It should have been obvious 2 years ago that their information was not backed by peer review. Does anyone actually read the full reports? Curiously the Himalayan glaciers mistake may have started like Chinese-whispers from a report that talked about the glaciers disappearing by 2350, not 2035. That’s 340 years, not 25. The Deccan Herald describes the report. But since large climate models can’t get the next eight years right (as they haven’t since 2001), why would we believe large models of glaciers would get the next 300 years right? Glaciers depend on precipitation and on temperature, and most have been retreating since 1800, many decades before human emissions of carbon dioxide became significant. The IPCC uses this image, below, in Chapter 10 of AR4. Click on it to look closely. 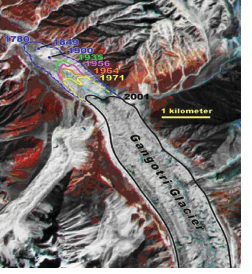 It shows the Gangotri glacier has been retreating since 1780, long before coal fired electricity was even thought of. Note below, that ironically this glacier is one of the ones that has stopped shrinking since the IPCC report came out. In the “the warmest decade on record” the Gangotri has stopped melting. What’s interesting about this is that there are far bigger scandals that have not been reported, that are far more critical of the conclusions the IPCC has come too. More important than “glaciers” that are slow moving, this story appears to represent a tipping point in the media. In September 2009 the IPCC were caught promoting a Wikipedia graph. The Hanno graph was placed in the UN Climate Change Science Compendium, but in the cold light of day ended up being a Wikipedia graph done by an ecologist called Hanno Sandvik. It was based on data-sets already known to be deeply flawed, the Jones and Mann set (the Hockey Stick), and the Briffa set (the other Hockey stick). The Jones and Mann set used trees that grow faster when CO2 increases, Mann left out some data he said he included, and the statistical methods used were so erroneous and powerful they created a hockey stick even if they were used on random red noise data sets instead of real tree rings. The Briffa set turned out to be heavily influenced by just one tree in remote northern Russia. I’ve covered the flaws in the Mann graph here, and the Briffa graph here. The biggest scandals are that the IPCC covered graphs like these as long ago as 2001, and none of their expert reviewers noticed what was essentially scientific fraud. Or, if their reviewers did notice it, the IPCC ignored them. There is plenty of evidence that scientists have discussed problems before and their information gets overwritten by the political appointees in the final draft. I’ve talked about New Scientist’s voluntary role as an unpaid PR arm of the IPCC before. PWL picked up on New Scientist’s defense, which came out two days ago (see New Scientist backpedals). I don’t think it matters that New Scientist published speculation from a scientist (as long as they label it as such), but where was New Scientist canvassing for other view points to check the reality of this? Did they interview other experts before printing such an extraordinary claim: 9,500 glaciers gone, in just 35 years? The report that triggered the analysis on Himalayan Glaciers came out in November 2009 from the Government of India. It documents how the glaciers don’t make very good thermometers for global warming, as glaciers in the Himalayas are growing, receding, and staying static according to their own local conditions, which apparently have a lot to do with snowfall, and with aerosol (dust) cover. Glaciers in the Himalayas, over a period of the last 100 years, behave in contrasting ways. As an example, Sonapani glacier has retreated by about 500m during the last one hundred years. On the other hand, Kangriz glacier has practically not retreated even an inch in the same period. Siachen glacier is believed to have shown an advance of about 700m between 1862 and 1909, followed by an equally rapid retreat of around 400m between 1929 and 1958, and hardly any retreat during the last 50 years. 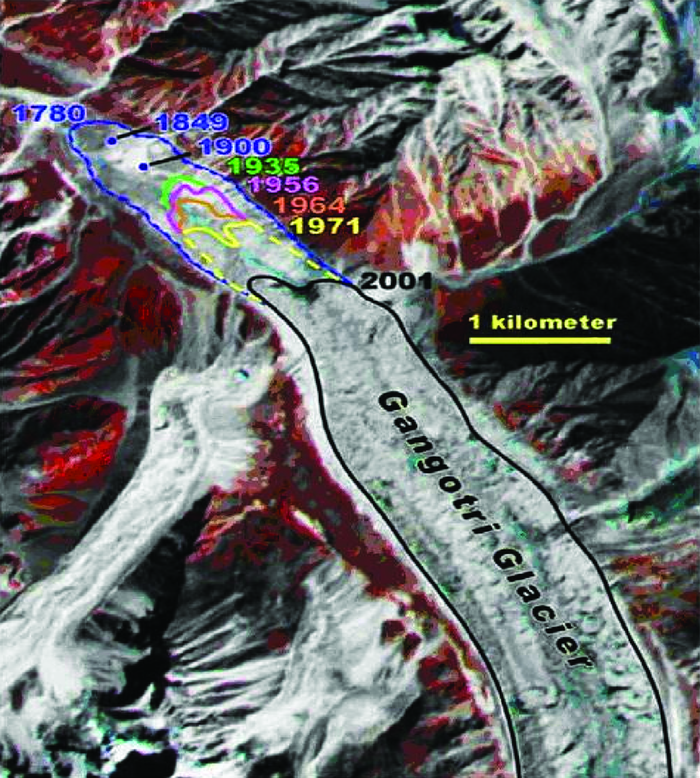 Gangotri glacier, which had hitherto been showing a rather rapid retreat, along its glacier front, at an average of around 20m per year till up to 2000 AD, has since slowed down considerably, and between September 2007 and June 2009 is practically at a standstill5. The same is true of the Bhagirathkharak and Zemu glaciers. What’s really remarkable is that some of the big media seems to be doing what they ought to have been doing all along. Is it the ClimateGate effect delayed? Thanks to Peter for pointing me at this story, and Helen D for some of the links, and to several others for the emails.